Do you have any plans to integrate Doit.im with Google Now? 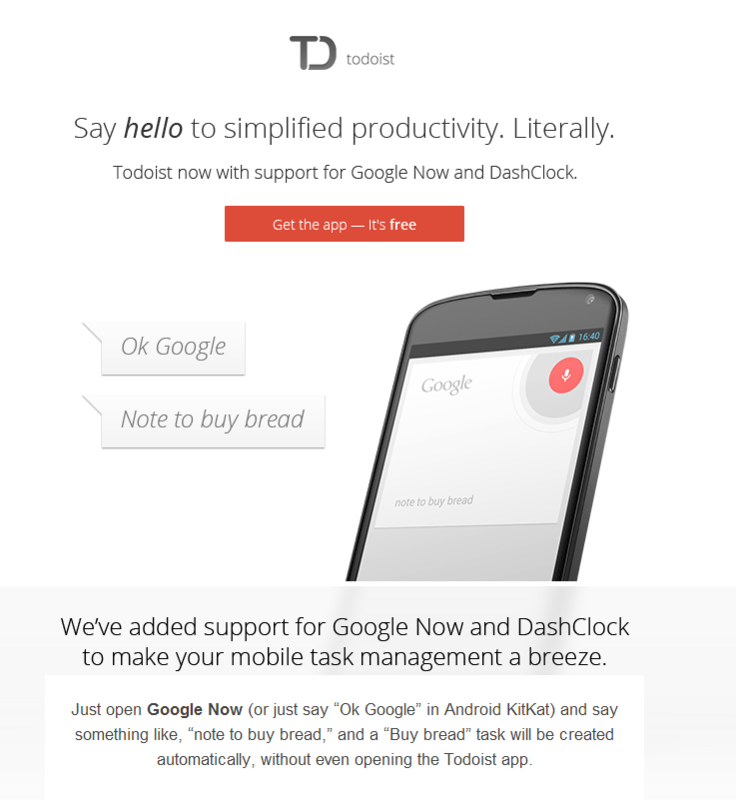 Do you need us to integrate with Google Now or you want us to support voice tasks? Voice tasks are tasks that will record what you are talking. I'm talking about Google Now integration, when you are saying "Ok, Google" or tap Mic button on the widget, Android open Google Now app then and listening for the commands. The feature that I'm proposed (actually not me, will describe below) is if you are saying "Add task Clean room" in Google Now it automatically will add doit.im task "Clean room". I think this feature will be especially useful on Moto X and Nexus 5 phones where you don't need even to touch the screen or unlock your phone (example - http://www.youtube.com/watch?v=WRn5le4fSQc). where the idea comes from - I was using todoist app some time ago and just received e-mail from them introducing this new feature. I have attached screenshot. Thank you for your information. We will look into this issue and consider it seriously. I'd love that feature. It would allow me to add tasks to my inbox whilst driving. I can fire up Google now with a button on my steering wheel and add the task with voice. We will take time to integrate with it. But sorry that we will not make it in near future. Please advice if this there is any progress on raising tasks from Google Now? Sorry to tell you that it will not be completed developing this year. This is a very important feature to me! Thank you for your feedback. We will take it into consideration. I too request this. Having voice commands would be extremely useful. We will update iPhone / Android app on 31st October, but it hasn't been in our development plan for now. Because we need to balance the whole development direction of the product and the costs are huge to develop a new feature. Sorry for any inconvenience brought to you, we will appreciate it very much if you could understand it. Thank you! This feature would be very interesting. Let's wait. Thanks for your understanding, we will work harder to do it better. @Linjiani has there been any progress on voice activated tasks. For example. "OK Google - Make a task: Clean House"
Looking forward to this being implemented. Not yet for the voice activated tasks. But we'll add them later. I am looking for a voice enabled function like that mentioned above, but also one that allows me to define the Context (or Project , Goal...) for the task. Any progress?